If there were one word to characterise these elections, it was crafted by Melenchon and is “dégagisme”, or cleaning-out. French President Emmanuel Macron has won his ambitious and unlikely bet. After having been elected president last May at the age of 39, he now holds an absolute majority in the National Assembly, with 350 seats out of 577 – his own movement, La République En Marche (LREM), having 308 MPs, the rest being held by his centrist MoDem allies. For a movement created only14 months ago and long considered by pundits and politicians alike as a “bubble”, this is an incredible success. Even if it is less than what the most recent opinion polls had predicted (up to 470 seats), and even though the 57% abstention rate has reached an apex in the history of the Fifth Republic. Now that he has turned the French party system upside down, he holds all the cards to implement his promised in-depth reform of a paralysed political, economic and social system. This is what most French voters elected him for. He will marginally revamp his government, which includes ministers from left, right and centre alongside personalities from civil society, serving under the conservative 46-year-old Prime Minister Édouard Philippe, before Parliament is due to convene on June 27. Yet he has to move fast on his reforms – first of the labour market, a very divisive one, on which negotiations with unions and employers have already started – knowing by experience as the former adviser and economic minister of the last Socialist president, François Hollande, that delaying crucial decisions means having their positive effects delayed till the end of his five year tenure, if not later. He knows this so well that some of his new bills are already in the pipeline, having even been partly drafted before he took office. If his predicted triumph has been downsized to an historical success in presiding over the demise of the two parties who ruled France in the last 60 years, it is mostly because of a massive abstention rate. Already noted during the first round, when other parties lost up to 60% of the votes obtained during the April-May presidential election, this conviction on the part of many voters that this is the only election that matters, also afflicted the Macron vote last Sunday. Some of his voters thought there was no point voting again as the dice were cast, others were not so keen to give him too big a majority. At the same time, it looks as if tactical voting from opposition voters, starting with the left and right extremes – France Insoumise (FI or Unsubdued Left) and National Front (FN) – helped defeat some LREM candidates who were ahead on the first round. Faced by these 350 seats, conservative Républicains and their centrist allies had their worse ever score with 130 seats (against 229 in the last Parliament). Socialists slumped to 30, 10% of their previous score. They are in total disarray, having lost their historical strongholds and some MPs only having survived thanks to Macron’s support for those considered “Macron compatible”, after they voiced support in public for some of his reforms and their willingness to support his government in its first vote of confidence. A split between such recruits and the hard-liners has already occurred in the Republicains, with the same expected to ensue any moment now within the Socialists, all of which should benefit the new President. Together for the first time, the far left and the far right will play an albeit minor role within a split opposition. FN has now 8 MPs instead of 2, including the election of its leader Ms Marine Le Pen. This is far less than they had hoped for and not enough to form a parliamentary group (a minimum of 15 MPs). The FI, the new populist party led by Jean-Luc Melenchon, has 17 MPs when it previously had none. This will give him a basis to pursue his war against Macron whom he considers as the devil incarnate of the worst type of capitalist and financial system. This is a huge disappointment for a man who still hoped a few weeks ago for a majority in Parliament and who considers Macron’s power as illegitimate because, he says, overlooking the fact that less than 2.5 millions voted for him, that it only represents 7.3 million registered voters out of 47.6 million. The Communists, rejecting fealty to the FI, cling to their 10 MPs. As for the Greens, bitterly torn among themselves, they have gone from 17 to one MP while French ecology icon, Nicolas Hulot, is now number 3 in the Philippe government, in charge of energy transition. If there were one word to characterise these elections, it was crafted by Melenchon and is “dégagisme”, or cleaning-out. “Dégagisme” of old politicians, old parties, of the old world, to build a new one made up of several bold promises regularly repeated like mantras by this gifted orator who can hold the attention of large audiences for hours, while sporting his Mao-like jacket. “Dégagisme” for him began with his rivals on the left, starting with the PS whom he vowed to destroy and replace, and with whom he rejected any alliance, even choosing to stand against the local head of the party in Marseilles, and winning. But it is also clear that a large majority of those who left the PS were from its moderate wing and disillusioned by Hollande as well as by his vociferous minority of hard-liners who took control of a rump party in the presidential primaries – their candidate came out fifth with only 6% of the vote at the presidential election – the rest siding with France Insoumise. So, the main beneficiary of this “dégagisme” against politicians who had been in charge for decades and were held responsible by so many of the French voters, left and right, has been Macron himself. It was they who helped him build his following before he received support from the centre and from part of the right in his “neither left nor right” or “and left and right” strategy. So the easy part of his job has now been done and a hard task lies ahead. Initially, few people believed he could be elected. Now all of a sudden they expect him to deliver. And fast. To balance his job-creating reforms by loosening up the French labour system with social reforms. To make it easier to lay-off but also to recruit. To improve the living of the less-well-off by simplifying taxes and financing health and unemployment benefits, not from wages but through a higher tax on all income, financial and corporate included, and by removing an obsolete and unjust housing tax for 80% of taxpayers. The French want things to change for the better but are at the same time afraid of the future. And they are also reluctant to see these changes affect them directly. Difficult people to deal with! But by promoting a more benevolent type of politics, by refusing to countenance verbal abuse against his opponents, asking people in rallies to stop booing them, he has tried to promote a more peaceful atmosphere. This might pacify the political arena for a time but there will be no honeymoon: he will have to deliver. He has started by building an image of himself as a leader. At home, by not ducking out of talking face to face with strikers fighting against the outsourcing of their jobs; booed at first, he managed at least twice to have a frank discussion with them without making, as he said, promises everyone knew he could not fulfil. Then he did the same in the international world where so many pundits said that he was too young and lacked the international exposure and guts to talk face to face with world leaders, starting with Trump and Putin. But now he will have to dirty his hands with day to day politics. He will do this with the help of his new majority in an Assembly profoundly affected by another brand of institutional ”dégagisme”. Thanks to a recent bill, no politician can be elected for more than three terms or hold more than one position of responsibility (deputy or senator, mayor, regional counsellor). Macron has also decided to implement strict parity between women and men in his government as among his candidates for Parliament. So the new Assembly will accommodate 432 (75%) new MPs, 223 of them women (160 from LREM) instead of 155. With an average age of 48 years instead of 54 years as before, they are elected under Macron’s name. New in politics but active in business, start-ups, social services, various jobs and professions who will have to learn the tricks of the trade while remaining close to people outside Parliament. Loyal? yes, but hopefully bringing new blood, new ideas, new experience to a political world far too long endogamous and male orientated. Will they all be up to the task? 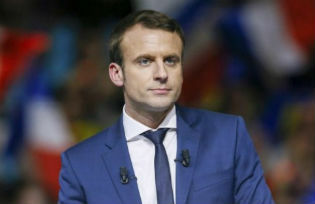 The fact is that they represent the first revolution – the title of Macron’s last book – to occur in fossilised French politics and a timely chance to bring France back as a European, and world power, thanks to his promised reforms and his pro-European stand at a moment when the EU is not that popular in the Old Continent. Just at the time when the EU’s future is at stake and Britain is starting her long, complex and, probably, bitter divorce proceedings. As the conservative Le Figaro, criticised by readers for being too accommodating with Macron wrote on Monday, “Absolute majority, absolute responsibility”. And Le Monde’s publisher added, “Rebuild confidence”. A tough programme indeed.